1st Runner-Up Best Card/Mahjong Game of 2007 Travel through the beautiful city of Venice, one of Italy's most intriguing cities, and solve an ancient mystery before Venice sinks into the water. Magic puzzle levels will guide you to thirteen forgotten paintings that hide a lost secret. 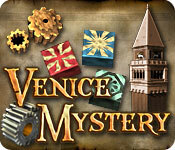 Will you be able to uncover the paintings in time and discover the old machine that can save Venice? Dive into a world of Mahjong and learn about the World’s Greatest Places! Princess Loreen and Prince Nathaniel have been kidnapped, and need your help to escape from a mysterious dungeon! The time has come for Nelly and Tom to stop a potential catastrophe and save the world in Treasure Seekers: The Time has Come!